Sound: Very good audience recording. Comments: Both this dates has been around on 'home made' cdr for a while. Both shows are now released on PRO-cdr bootleg in ones, by Japanese label TRAIL. 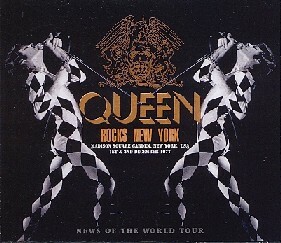 Both this New York, USA concerts comes from their "News Of The World" American Tour. Not sure if 'God Save The Queen' at the end is included. I'll checks later. Roots: Original bootleg. Recording comes from fan tapes, or probably from 'neutral' cdr's. Both shows has been around for a time on 'private' cdr's. 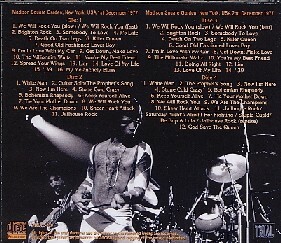 Inside back sleeve, and scan of CDR 3.